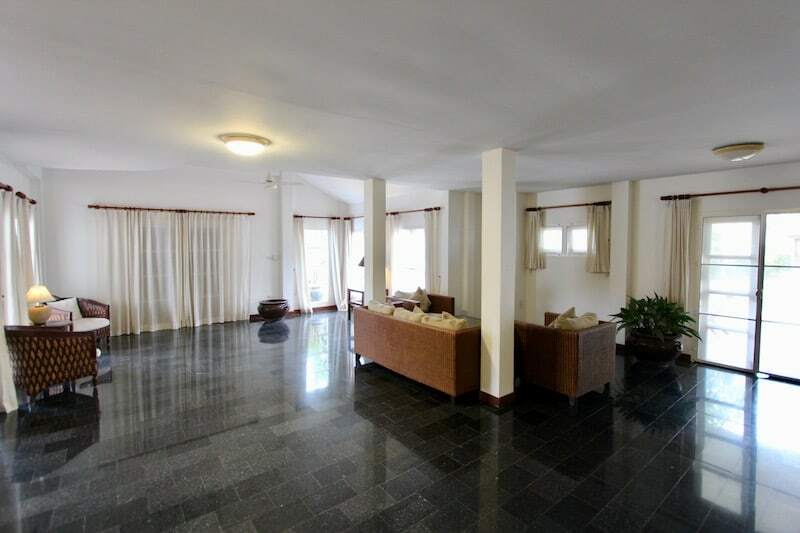 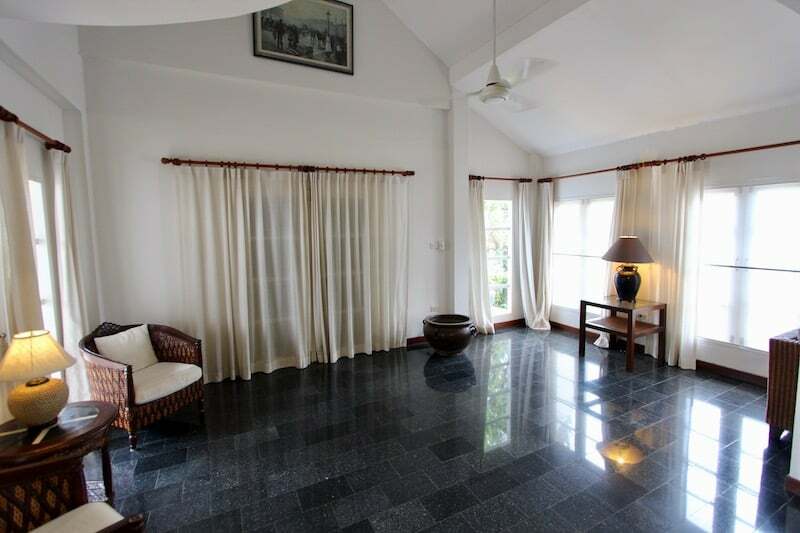 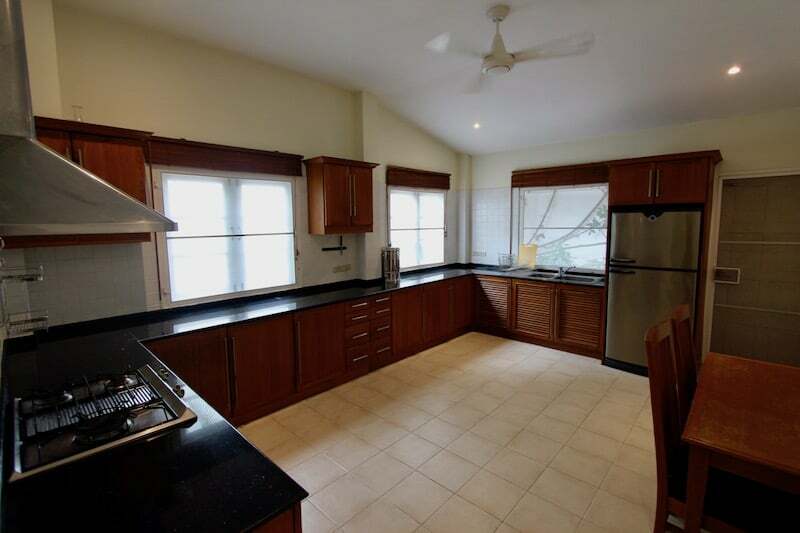 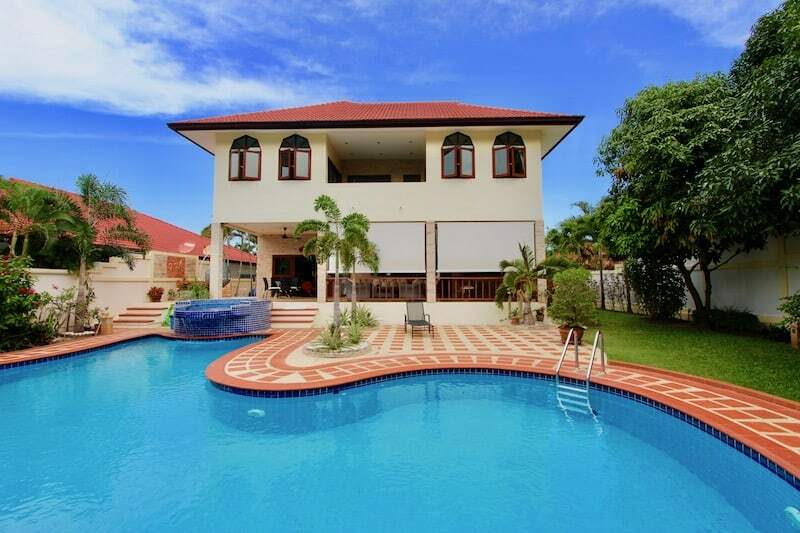 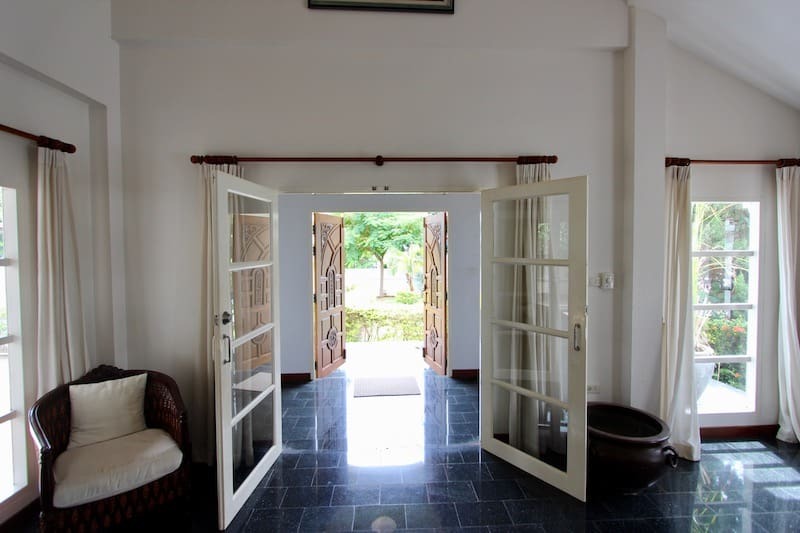 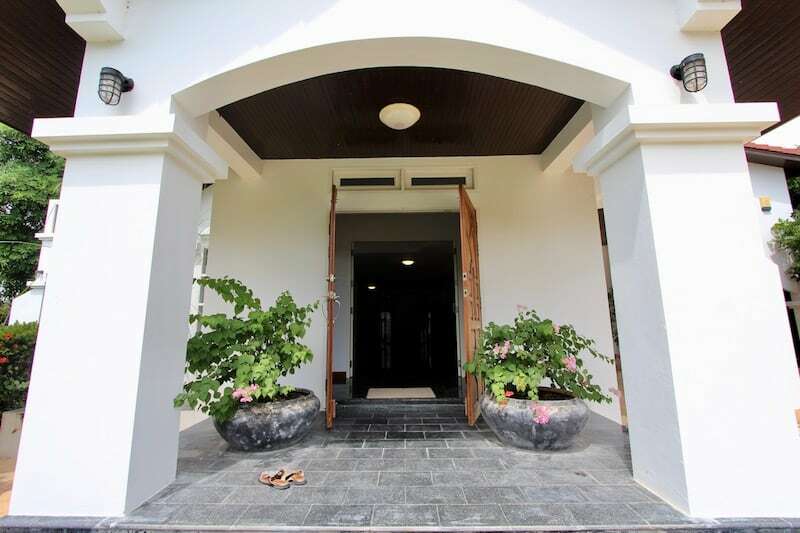 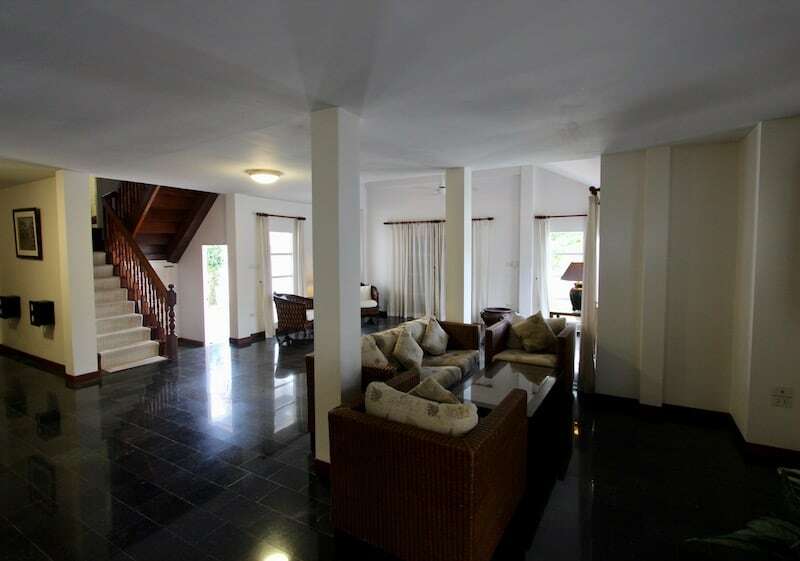 This Hua Hin property for sale comprises of 4 bedrooms, 4 bathrooms, a private office, large living room, dining room, family room, separated kitchen and a large attached apartment, perfect for a live-in maid or older teenager needing their own privacy. 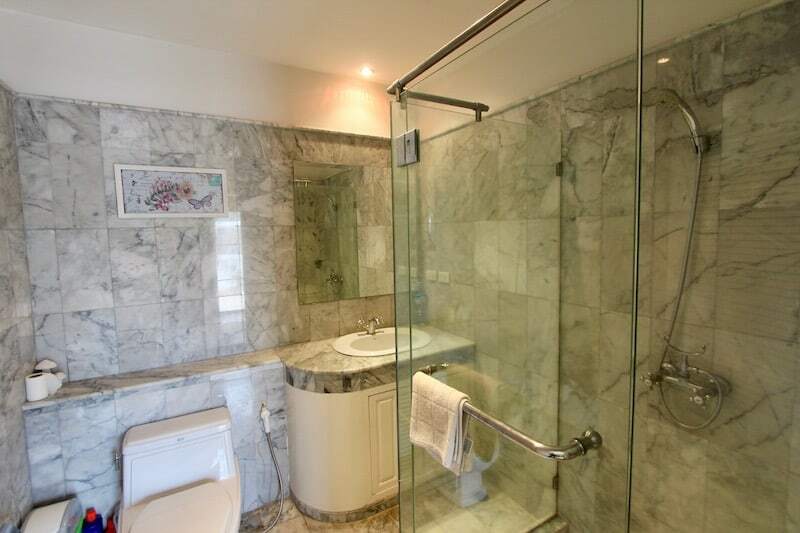 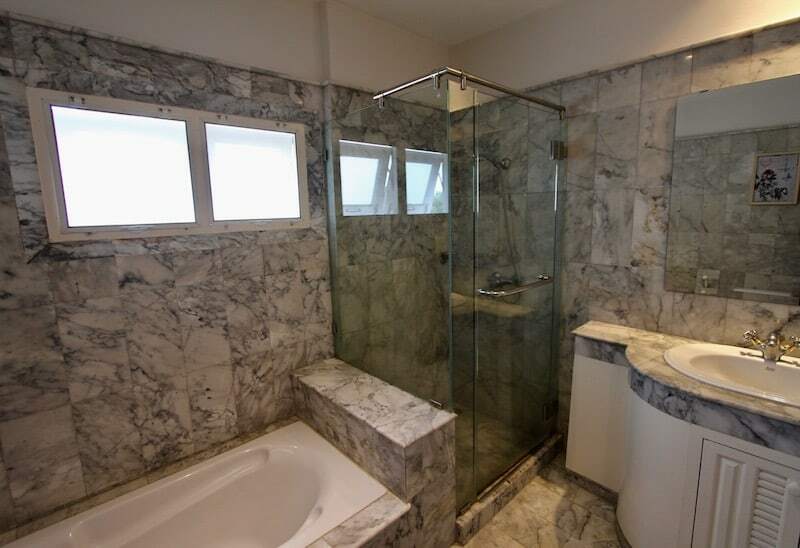 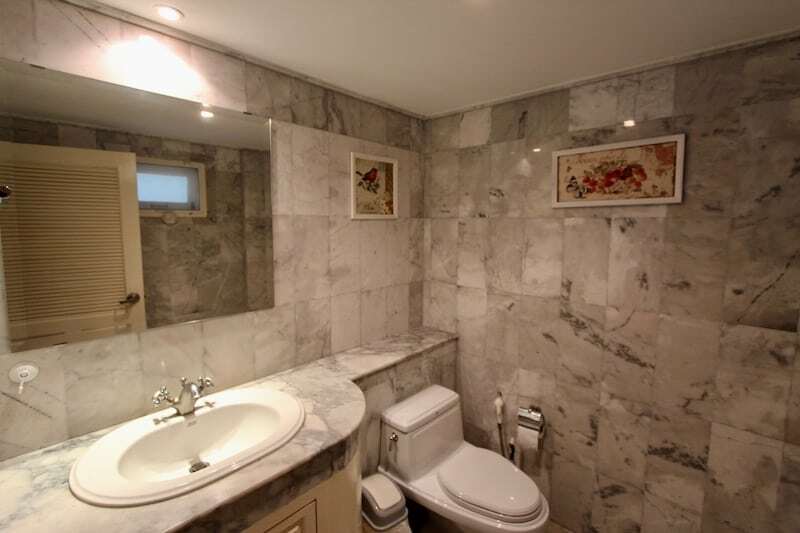 Each of the bathrooms are tiled in white cararra marble. 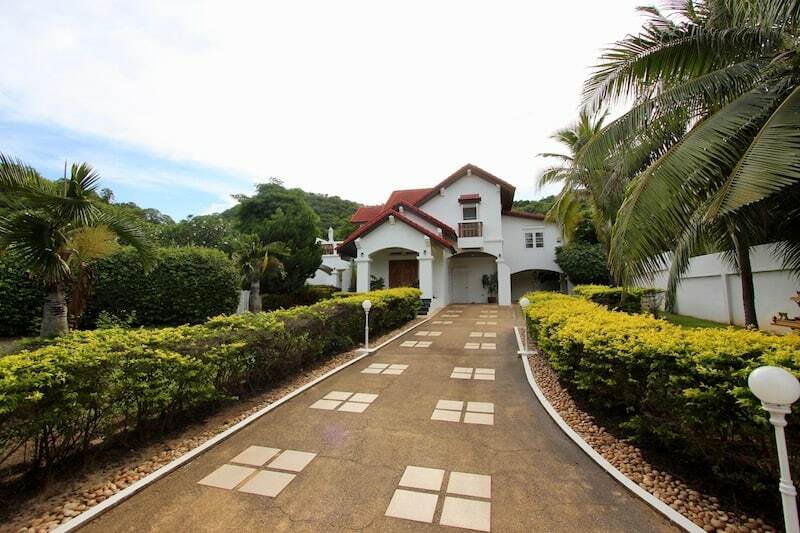 There is a covered carport, a luxuriously long driveway, motorized security gate, 3 beautiful balconies and an inviting formal entrance. 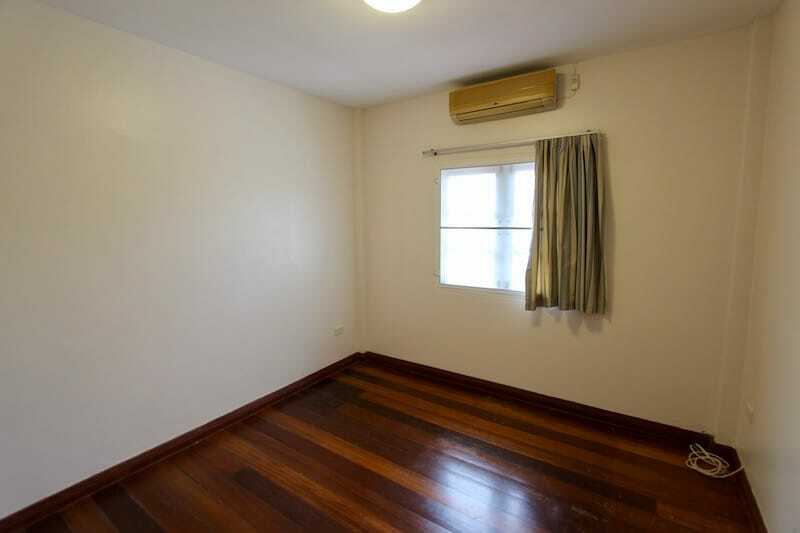 The house is sold “partially furnished”. 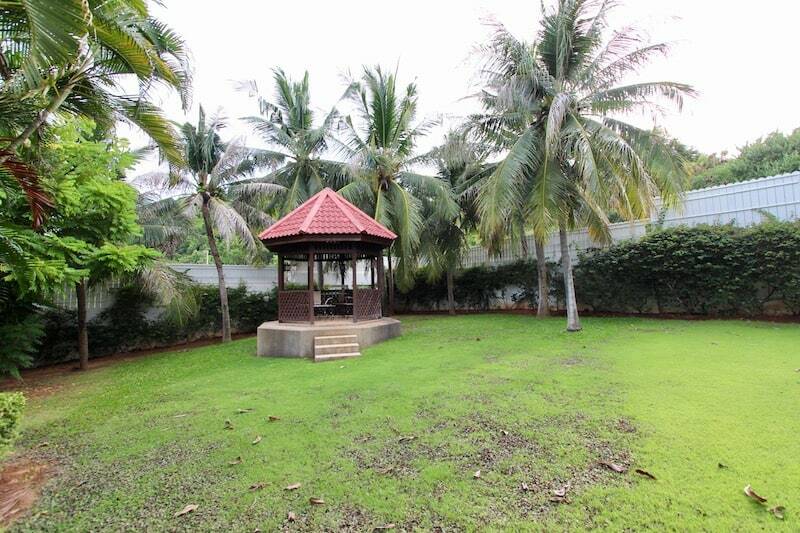 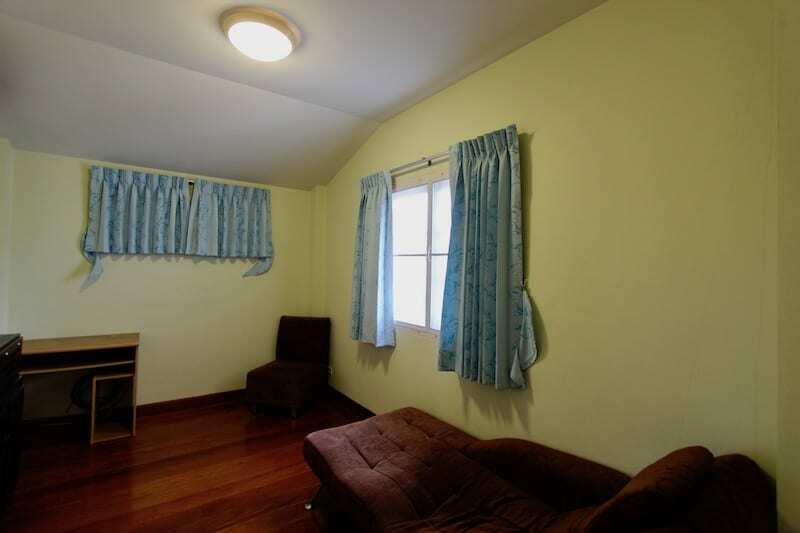 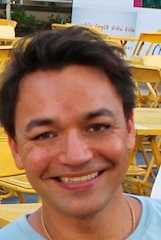 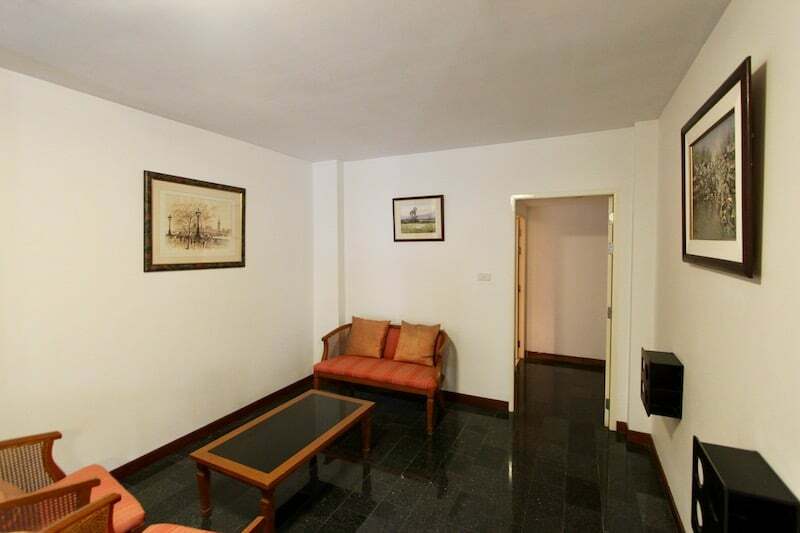 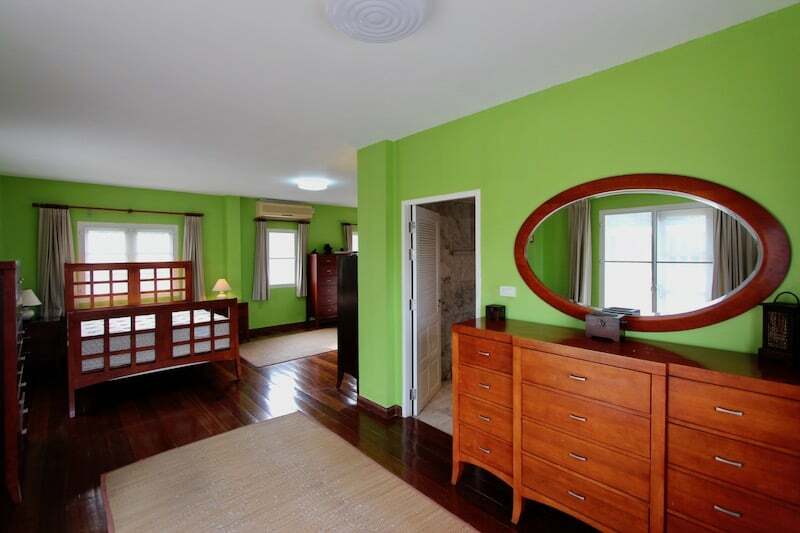 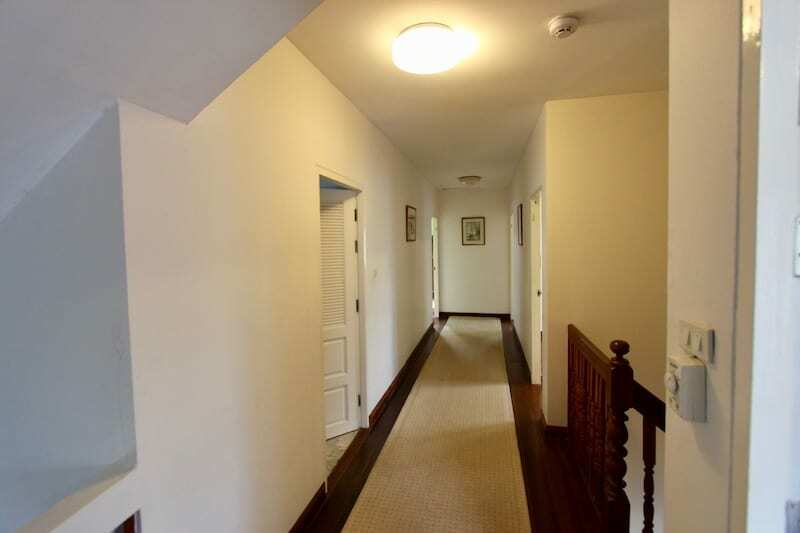 The property is in very good condition and has been well maintained. 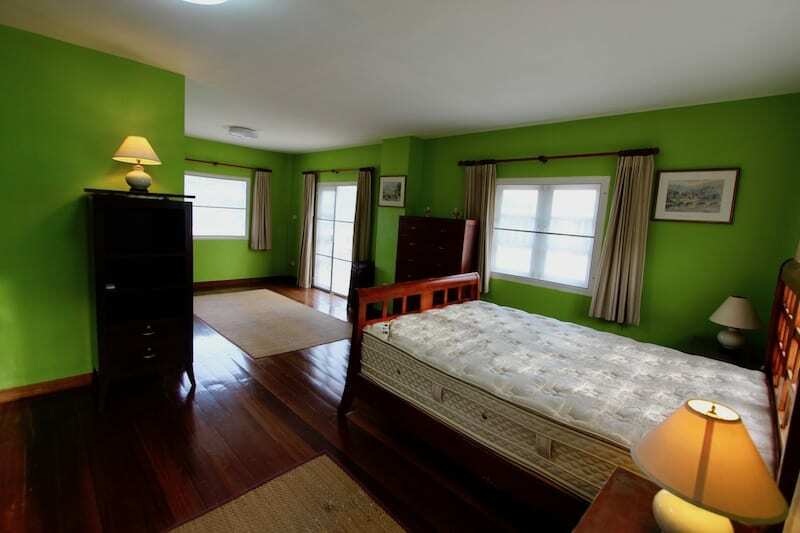 The covered terrance has teak wood flooring. 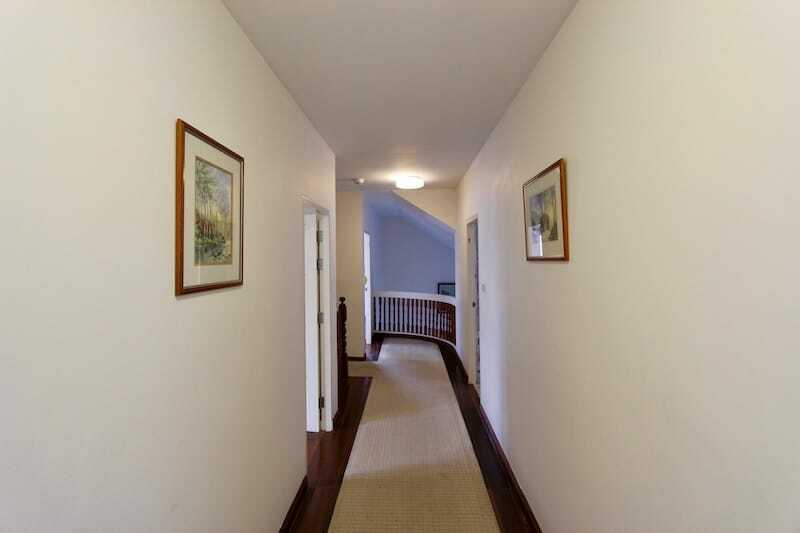 From the second floor balcony, there is an additional emergency egress for added safety. 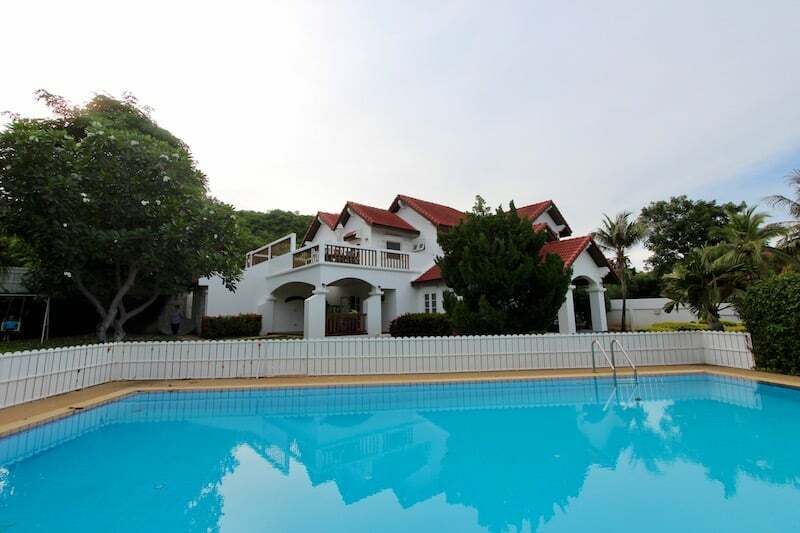 The house sits on over a Rai of land (2,026 sqm), situated at the base of a nearby mountain, overlooking the Gulf of Siam. 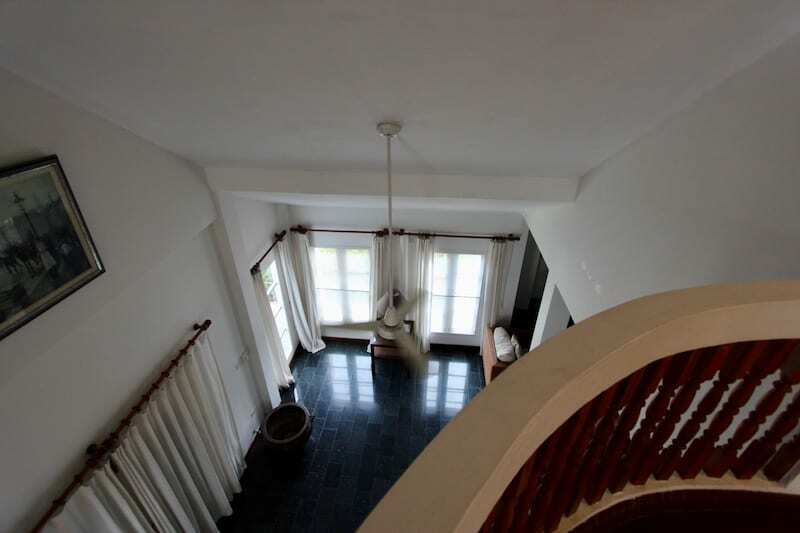 There is a sliver of a sea-view from master bedroom balcony. 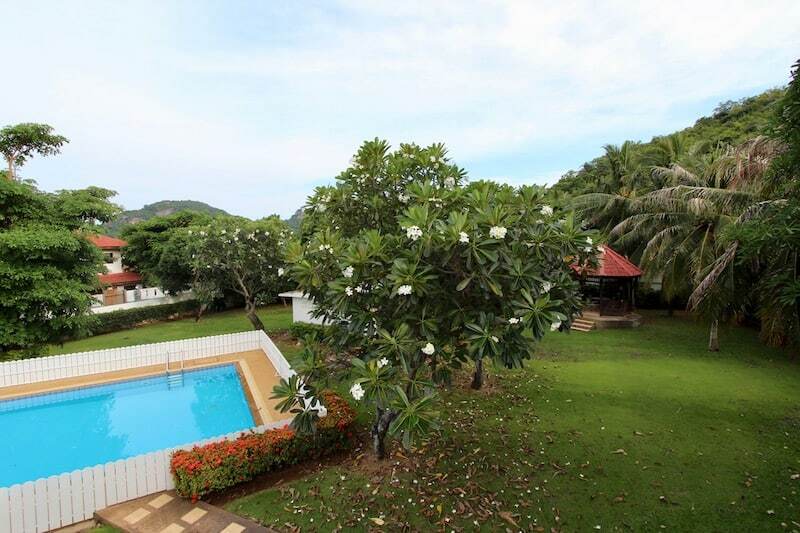 That said, the surrounding panoramic mountain views are still beautiful and full of lush greenery, providing plenty of privacy. 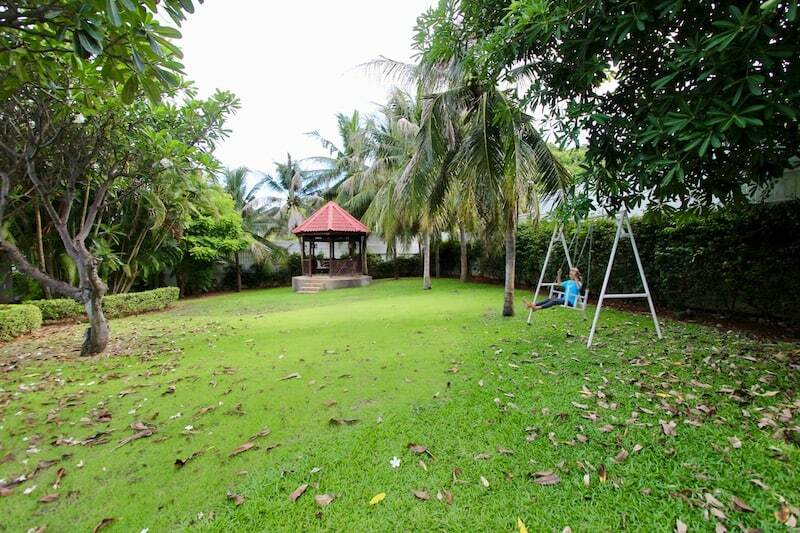 The gardens are well kept, with plenty of open space to kick a soccer ball around, or to allow children to run and play freely. 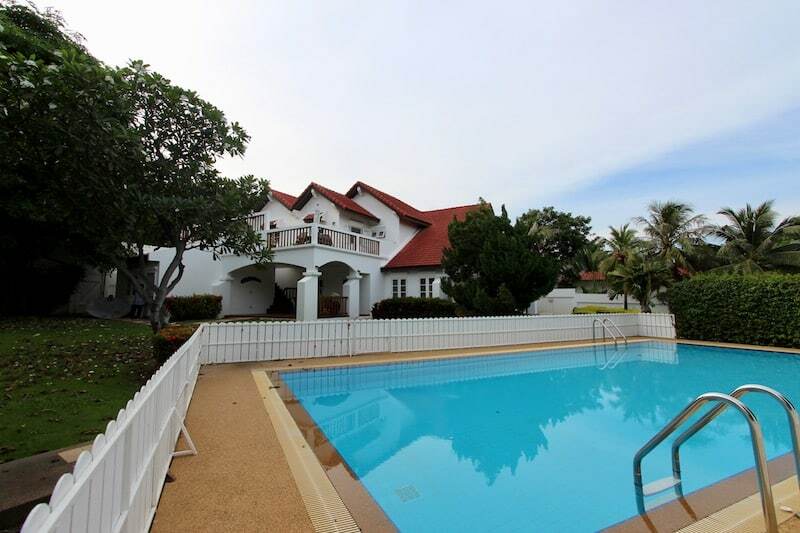 The swimming pool is new, with a security fence in place to keep small children from accidentally falling in. 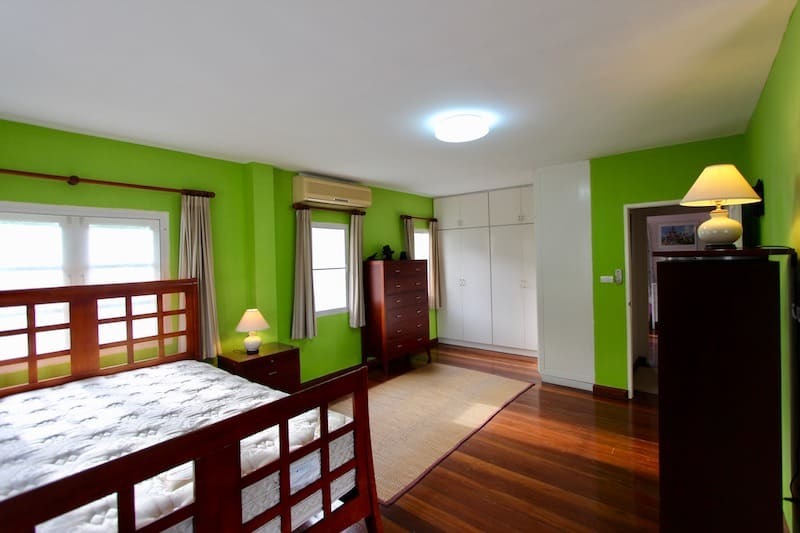 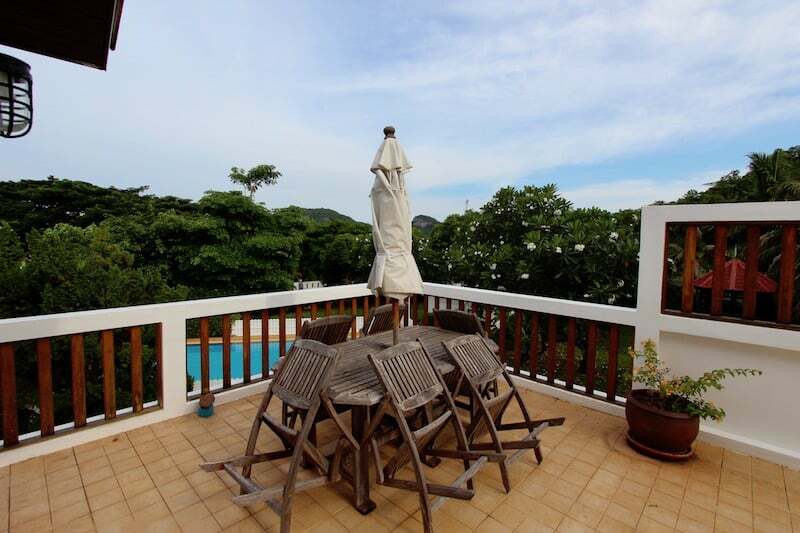 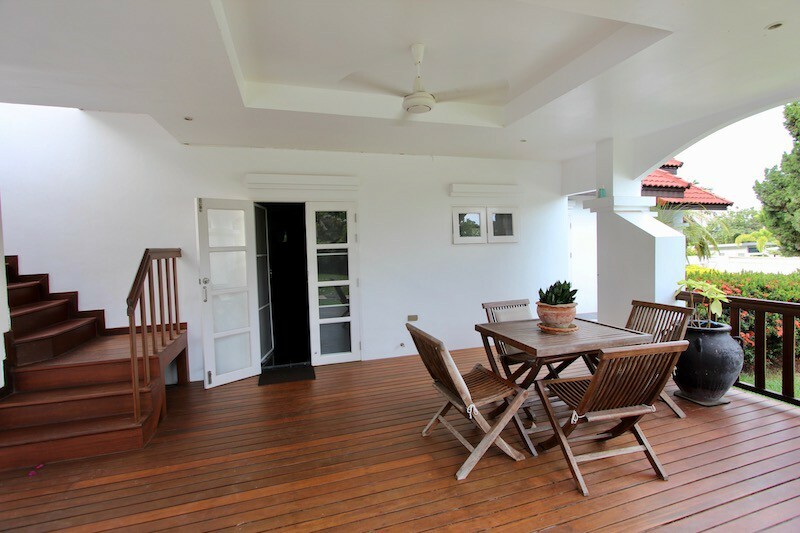 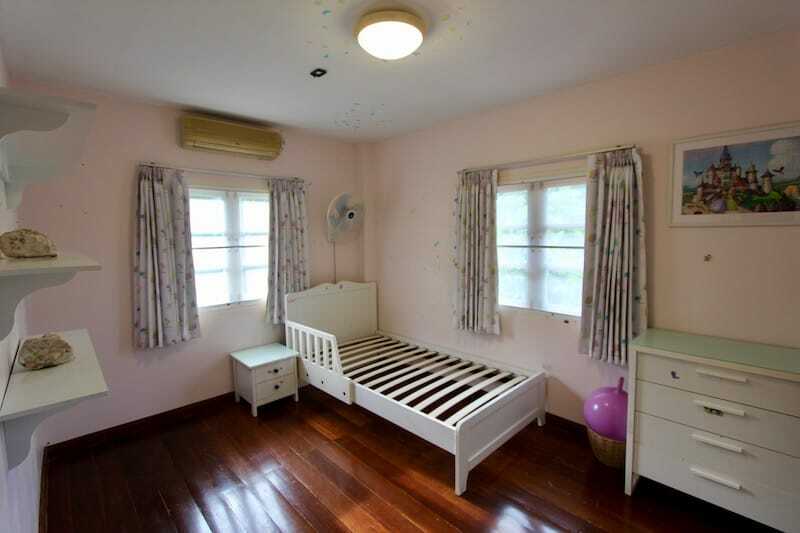 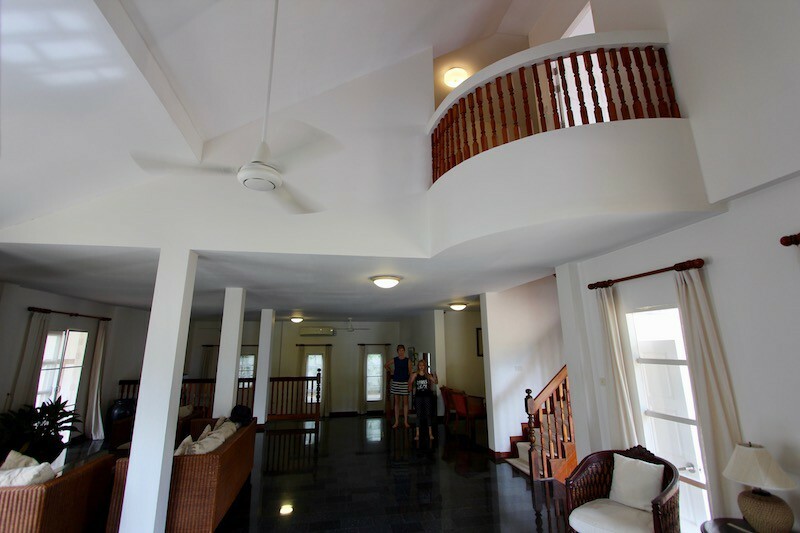 The house is located in a quite neighborhood with friendly neighbors, but close to Hua Hin town center for convenience and easy access to local beaches, international schools, shopping, restaurants, and other entertainment facilities. 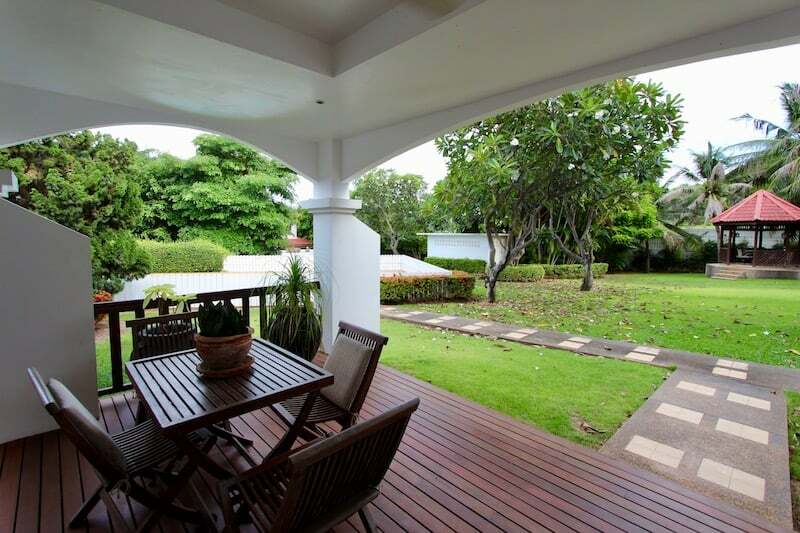 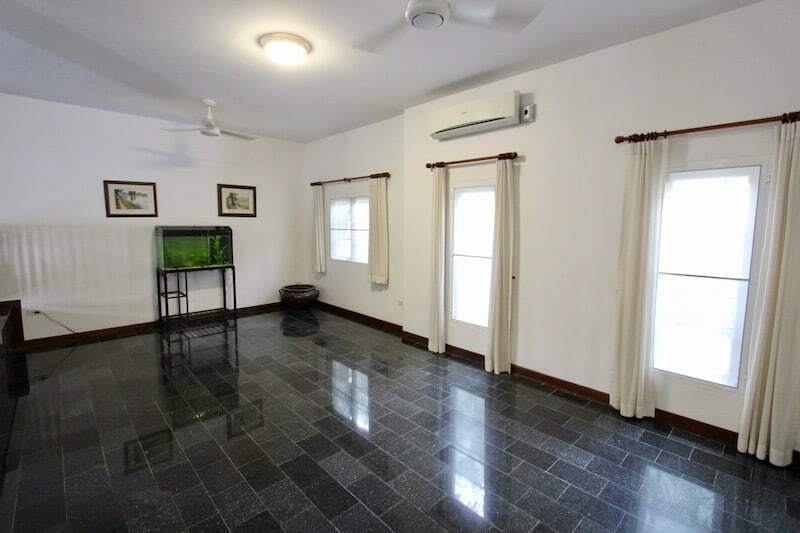 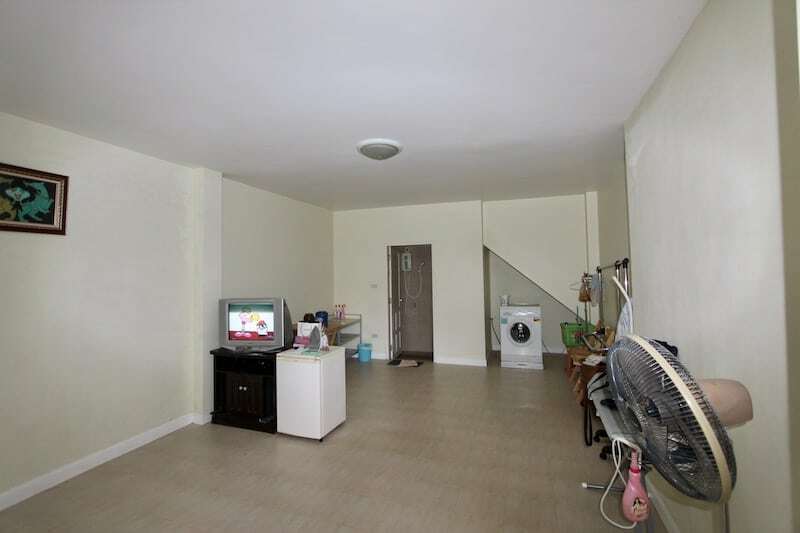 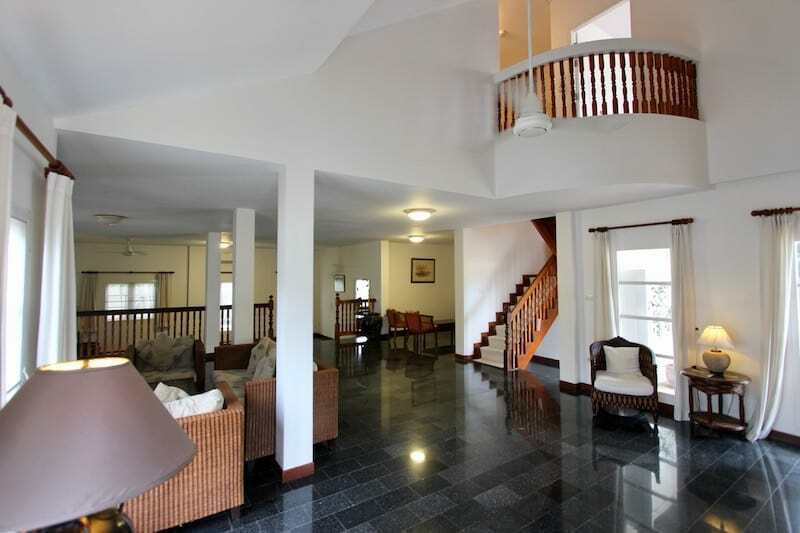 This Hua Hin house is priced to sell quickly. 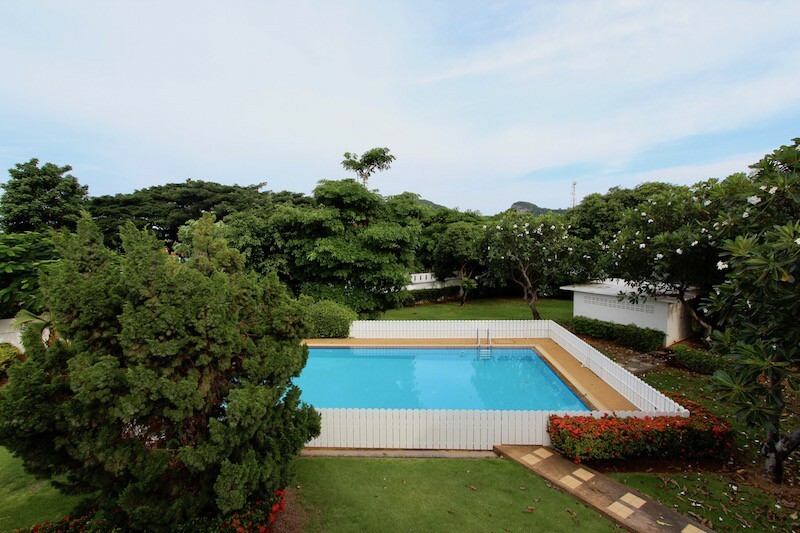 Please call Executive Homes Hua Hin at 085-264-2158 to schedule an appointment to view.